The U21 and U19 Junior Ladies volleyball teams are celebrating after their success against Northern Ireland on March 19th, held in Craigavon, Armagh winning 3-0 and 3-1 in their respective matches. 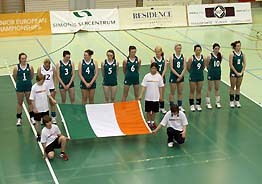 Both teams consist of players who are competing for a place on the Irish team that will participate in the Small Nations European Championship during Easter 2008. Led by captains Edel Nolan and Anna Miller, Ireland were superior to Northern Ireland in defence and attack, though strong serves from the Northern Irish team put Ireland under pressure in both matches. Introducing Anna Farrell for the first time as a libero and Niamh O'Sullivan as an opposite attacker, illustrated the versatility of the players on this juniors squad. Excellent setting decisions from setters Aisling Gayle and Shauna Parle gave attackers Fionnuala Nevin, Emma Martin, Jennifer Corrigan, Chloe Campbell, Ruth Healy, Denise Gaule, Orla Fitzpatrick and Caileen Meehan the opportunity to shine. Substitutes Grainne Mc Nieve, Aisling Bell, Kate Heron, Gayla Stanley, Eadoin O'Flanagan, Aishling Croghan, Sinead Croghan, Charlotte Duffy, Ciara Dixon provided good variety options from the bench and experienced libero Jill McDowell was strong in defence. Irish coaches Denise Tallon and Grainne Culliton were very impressed with the junior teams in this, their first international competition. The competition is now a regular feature of St Patrick's weekend festival and will be held in Dublin in 2008. The junior and senior ladies squad had an early start in Dublin Airport Friday morning (28th) at 5:45. Once everyone had stocked up on magazines, we set off on their two hour flight to Franfurt, to catch a bus to Luxembourg. After lunch, the junior squad trained for 2 hours. After a rest and light rest, the junior team played two matches against two teams from Echternach, both senior teams. The first match was narrowly lost 2-1, having lost set 1 by 2 points. This did nothing to dampen team spirits and we went on to play our second game, all guns blazing. This was a tougher team, with great attacks and hard serves. It was great experience to play against such a good team that beat us 2-0. A very tired team left for the hostel for a good nights sleep. A very enjoyable time was had by all. Another early start for the junior squad. After breakfast at 7:30, we headed for a 2 hour training session. Prior to training, we watched the senior team and their pre-match warmup which was a good learning experience. We did extensive training on blocking and diving before watching the final set of the seniors match. On return to the hostel, we had some "Schnitzel" for lunch and a well earned rest. We then had a brilliant training session for a further 2.5 hours, involving cover drills and 3 on 3 game practice. Once we had showered, we met upstairs for team bonding sessions and work, before discussing with our coach the weekend itself and to reaffirm our goals going forward. We also could openly discuss development needs we would like worked on at trainings going forward. The senior and junior coach went for a meal in an Italian restaurant with all coaches and the President of the VAI before retiring for the evening. Overall the day was a great experience for the team and it helped us to get on better as a group. played the second two sets. Fatigue got the better of us and we lost 2-0 to a junior German club team. and everyone greatly enjoyed the match as it was a great experience,unfortunatly we had to leave after the first set to to catch our plane. Overall the weekend was really enjoyable and a great experience. We wish to thank all involved in arranging it. The Senior Women Squad had a busy Saint Patrickâs weekend with four matches against Premier Women teams and visiting German club team, Marl. The highlight of the weekend came on Saturday when the Seniors met Marl on the main court in DCU at 2pm, in front of a large crowd of supporters. The Seniors beat Marl 3-0, but not without a tough battle in the first two sets. Setter Aileen Minihan led the Irish offence with varied attacks, and 2 quick kills of her own early in the first set. Captain Gemma Garvan and opposite player Tara Dawson kept long rallies alive with their quick defence of Marl middle hitters Martina Becke and Britta Frees. Aided by the passing of libero Louise McConnell, wing hitter Olive Rossiter scored 3 kills to bring Ireland to a 19-13 lead. Not willing to give up easily, Marl fought back behind the strong service of Kathrin Zilske and net play of Silke Arms to tie the score at 19-19. Unforced errors for both sides, followed by a kill for Marl setter Sarah Marks, and another for Irish setter Minihan, tied the score again at 21-21. Garvan gave Ireland the lead for good with a kill from the wing, and the Seniors held on for a 25-21 win. Set 2 began with the two teams neck and neck to 11-11. Irelandâs Jana Langford led her squadâs defence against the strong attack of Marlâs Verena Moritz, while Irish middle Elke Wohlleben connected for 2 early kills. Miriam Gormally helped the home team to pull away 19-13 with her quick middle attack. Marl gained a few points on Irish errors, but Pamela OâDonnell stopped Marlâs attack from starting again with her brilliant net play. Jennifer Corrigan came off the bench to add her own block, and Ireland never looked back, winning the set 25-20. The German side were no match for Ireland in set 3. Fantastic service by Elke Wohlleben kept Marlâs passing under pressure, and pushed by Gormallyâs 4 kills at the net, Ireland jumped to a fast 12-2 lead. Marl was unable to catch up, as Garvan and Dawson added 5 service points each. Substitute Edel Nolan registered a kill near the end of the set before Gormally ended the set with a stuff block at the net, Ireland on top 25-8. Well done to the Senior Women, and Good Luck in the upcoming Small Nations European Qualifying Tournament in May! 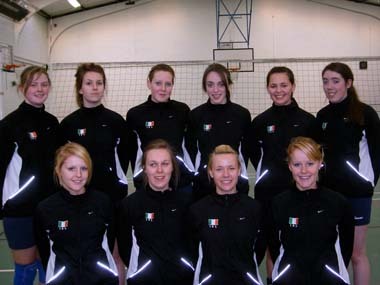 The Irish Junior Womenâs Volleyball team travelled to Shaan, Liechtenstein on Easter Sunday to participate in the 2008 Small Nations European Championship finals. There was great excitement as Jennifer Corrigan, captain, led her team out on day 1 of the competition to play against Malta. Ireland was leading in set 1 12-11 but unfortunately could not hold onto the lead and lost set 1 25-15. Nerves were obvious in set 2, but Ireland over-came these in set 3 to compete in a very close encounter. Day 2 saw Ireland take on Cyprus, eventual runners-up in the competition. The score on the day did not reflect the high level and excitement of the match that took place. Ireland lost 3-0 (25-14, 25-4, 25-10) but all spectators were enthralled by set 1 and 3 where Ireland matched the skills of a very good Cypriot team, but unfortunately could not win the long rallies that were the talking point of the match. Ireland suffered a blow at training before the Lux match and lost their Opposite player, Sinead Croghan to injury. Having resolved themselves with this disappointment, Luxembourg was a huge opposition to face, with a player on the team actively competing with the senior team. The eventual winners of the competition, Luxembourg were stronger in terms of player development and their experience of competition and previous success was evident from their play. Their attacking took its toll on the Irish squad, with one player taken off injured as a result (luckily not a serious injury). The result reflects the higher level of skills of the Lux team, while also the fighting spirit of the Irish team in set 2. Luxembourg won 3-0 (25-9, 25-15, 25-9). This was the match we had all been waiting for in the week. Ireland having beaten Northern Ireland a week before the competition to win the inaugural Annual Volleyball Cup, left NI out for revenge. The first set was evenly balanced, with Ireland narrowly winning by 2 points. Set 2 was equally competitive but Ireland feeling the confidence of the set already won, attacked and served very strongly to take the second set. Ireland lost focus in set 3 to lose it by 5 points, and never recovered their confidence from this. 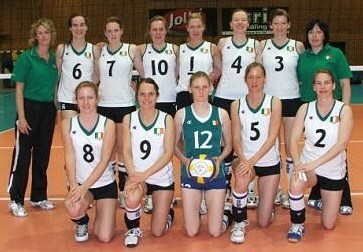 Northern Ireland won the match 3-2 (24-26,18-25,25-20,25-16,15-9). Squad: Gemma Garvan (Capt. ), Aileen Minihan, Elke Wohlleben, Miriam Gormally, Louise McConnell, Tara Dawson, Jana Langford, Oliver Rossiter, Pamela OâDonnell, Jennifer Corrigan, Edel Nolan. Following a two-year training regime, a new Irish squad travelled to the Faroe Islands for the Small Nations Qualifying Tournament on the 15th of May. The team were up against tough opposition from the host nation, Liechtenstein, an experienced Scottish team, and veterans to the competition, Luxembourg. The team started a bit apprehensively against a tall and experienced Liechtenstein team, going down in 3 sets 15-25, 17- 25, 23-25. The Irish gained confidence in the third set however, as they rallied from 10-21 down. Superb blocking by middles Miriam Gormally and Elke Wohlleben (3 each), as well as serving and defence from Tara Dawson led the late comeback. The team came out fighting the next day with great defensive play seeing them take a set off the Faroe Islands and also our closest neighbours the Scottish team. These games had several long rallies as Irelandâs defensive play â led by libero Louise McConnell and Jana Langford - made the opposition work very hard for every point. On the offensive side, Olive Rossiter tallied 11 kills vs. Faroese and 8 vs. Scotland, assisted by brilliant passing from captain Gemma Garvan. Ireland 1-3 Scotland	(15-25, 22-25, 25-21, 13-25). It was a fantastic experience for the team that travelled and who received many favourable comments from other nations regarding the structure of the Irish unit. It was particularly good to see the team build and experience this level of competition with the inclusion of both Jenny Corrigan and Edel Nolan who joined the squad from the Junior set-up, and who both have very long International careers ahead of them.